The 500 Festival Parade is one of the biggest and best parades in the United States, and it’s right here in Indianapolis. A big part of the celebrated month of May in Indy, the parade is tops on the “can’t miss” list for local families and visitors. Bands, floats, giant helium filled floats, celebrities, mascots and of course, race cars and drivers take to the street and wave and smile at fans. Music will fill the air and over 300,000 spectators will cheer and applaud for the parade participants. There are several ways to watch the 500 Festival parade, but getting a reserved seating ticket is certainly the best. This year, tickets start at $10 per person for family groups and large groups. 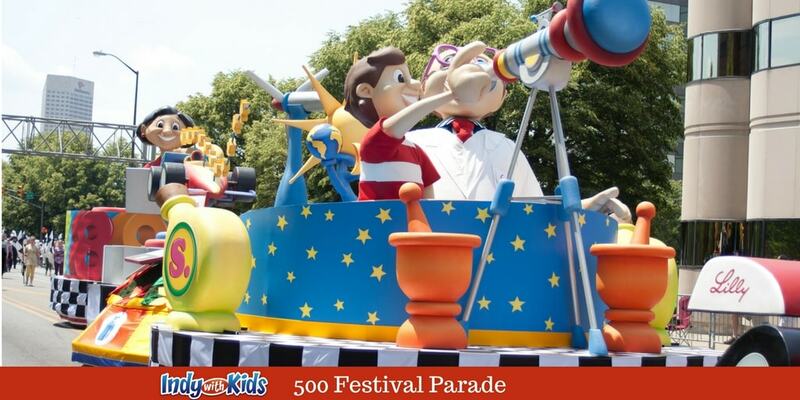 My children love seeing the colorful floats, pointing out familiar characters and watching the princesses and race car drivers. If you are watching with children, bring snacks, water, sunblock, hats and sunglasses for the whole family. While tickets guarantee that you get a seat and don’t have to arrive super early to stake your claim, some families find free seating to work out for them. New this year, in addition to providing value priced tickets, public address announcements will be made in both Spanish and English in sections 23 – 26! One of the original events produced by the 500 Festival, the IPL 500 Festival Parade has grown to be one of the signature events held in the United States each year. The Parade is the only 500 Festival event that has taken place every year since the organization’s founding in 1957. The 2018 IPL 500 Festival Parade will be held on May 25, the eve of the Indianapolis 500. 300,000 spectators are expected to line the streets of Indianapolis, joined by another one million watching from their televisions around the country, to view one of the nation’s premier parades, alongside the Pasadena Tournament of Roses and the Macy’s Thanksgiving Day Parade. The IPL 500 Festival Parade allows all spectators to witness the pageantry and larger-than-life floats light up the streets of downtown Indianapolis. Well-known celebrities, marching bands, patriotic units, specialty units, spectacular floats and giant helium balloons will fill the streets to celebrate the world’s largest single-day sporting event, the Indianapolis 500.